UPDATE: Westwood (Mass.) Police made an arrest in the case. His car: a 2003 Hyundai Sonata. Today, we have pictures and video released by a Massachusetts district attorney's office regarding the case of a 26-year-old woman who was seriously injured when struck by a vehicle while walking her dog on Monday night. Authorities say the driver initially slowed down, but then sped off when he or she saw what had happened. Westwood police said the driver of the vehicle that hit the woman did not stop, but the car likely sustained front end damage and now has a broken headlight assembly. 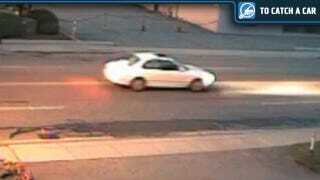 Investigators determined the vehicle was a mid-sized white or light-colored four-door sedan with a moon roof. Jillian Belanger remains hospitalized in serious condition. Her bull terrier, Bianca, was killed. So, what kind of car is this?